The programming formula at Santa Fe Opera generally calls for two opera chestnuts, one 20th-century classic, one world or American premiere, and one Baroque or wild card opera. The company took a bit of a risk with one of the chestnut choices this season, its first production of Gounod's Faust, but ticket sales do not appear to have been affected by a problematic production (it receives a total of ten performances). 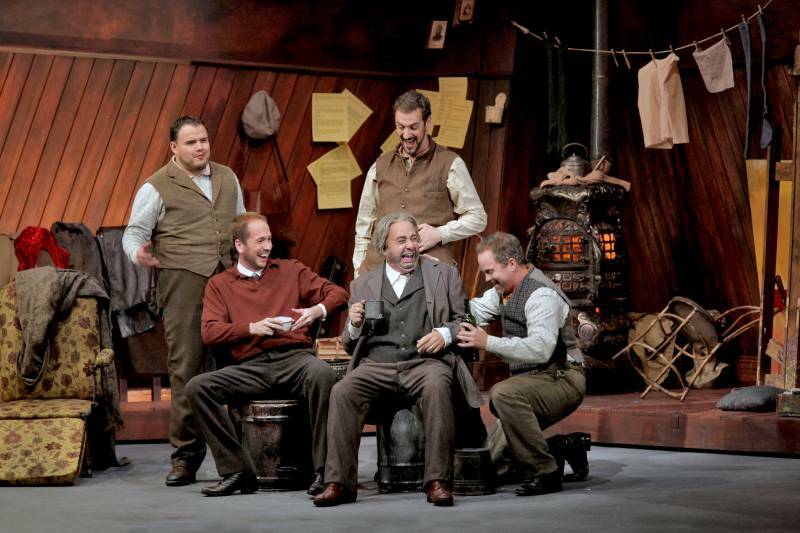 The other warhorse is a no-brainer, a revival of the 2007 production of Puccini's La Bohème (reviewed by Michael Lodico), which at eleven performances, all of them likely to sell out, is the most-performed opera at Santa Fe this summer. The results do not have to be extraordinary, or even all that good, for tickets to move. As heard last night, under a menacing, dark-clouded, and lightning-streaked sky, the cast was, with a few exceptions, excellent. 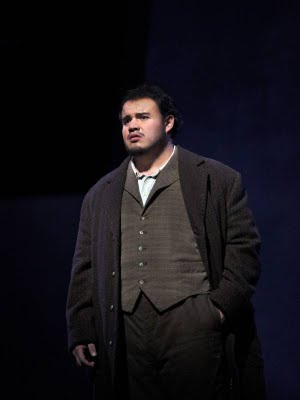 David Lomelí's Rodolfo made the biggest splash, in his Santa Fe debut: a winner of the 2006 Operalia Competition, the Mexican tenor sang with heroic poise, with seemingly boundless energy and control, and is definitely a singer to watch. The only limitations were visual, in that he was a little stiff on stage, his hands often in his pockets, but he came across as an innocent, slightly lumpy romantic. Matching him was the refined Marcello of former Santa Fe apprentice Corey McHern, less so the dramatically easy, if slightly silly and not vocally weighty Schaunard of Keith Phares. Numbered also among the revelations was the robust, rich Colline of Christian Van Horn. With each performance of this opera, Colline's Act IV coat aria, Vecchia zimarra, is becoming my favorite moment in the score, and Van Horn's stalwart tone and powerful low notes certainly continued that trend. In fact, Van Horn was squandered a bit in this opera, when he could have been cast as Méphistophélès in Faust. Although we have admired the voice of soprano Ana María Martínez before, she did not sound quite in command of the role of Mimi, although definitely not as outclassed as she was by Butterfly in Washington last season. There was much to admire, especially exquisitely controlled decrescendos on high notes to pianissimo and heft on loud high notes, and she was a lovely and fragile Mimi. Heidi Stober had some hits at Wolf Trap a few years ago, but her Musetta was the least pleasing of the leads, overly coy, too self-indulgent in tempo and phrasing, and then underpowered when she needed to bite like a viper. Former Santa Fe apprentice Thomas Hammons, who had a hilarious turn in L'Elisir d'Amore here in 2009, was equally zany as the bumbling landlord, Benoit. The staging, by Paul Curran, is nothing special but it gets the job done quite well. Kevin Knight's set alternates between a sharply angled corner background for the artists' garret and a large V-shaped space for the crowd scenes, all of it rather grim. The crowd scenes were manic, a little over-active but engaging, and the chorus, down to the children (Susanne Sheston was chorus master), sang well and forthrightly, giving verve to the visual pageantry. Curran chose not to update the setting from the gritty 19th century of Henry Mürger's Scènes de la vie de bohème, one of my favorite books in the Paris Reading Project, avoiding some of the embarrassing excesses of Washington National Opera's production, for example. 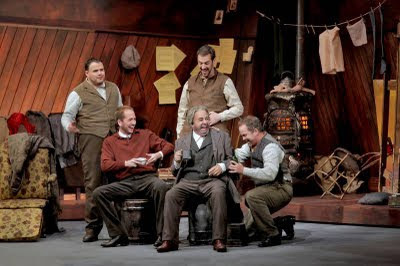 As he also showed in his 2008 production of Billy Budd, Curran gave careful thought to the movements and emotional reactions of the characters, making the comic relief scenes of the artists' quartet and especially the tragic conclusion believable and emotive. Close attention to the details of the libretto and score pay off in this sort of directing, rather than trying to overlay an opera with whatever philosophical or political ideas happen to be in your head at the time. The lovely mezzo-soprano Joyce DiDonato was in the house last night, to see the Santa Fe Opera conducting debut of her husband, Leonardo Vordoni. The couple met here in Santa Fe, during that memorable Laurent Pelly production of Massenet's Cendrillon in 2006, in a whirlwind romance. Vordoni may be a good conductor, but you could not tell it from this performance, which was a bit of a jumble, the sense of ensemble discombobulation more pronounced perhaps by comparison to the refined and precise version by Lorin Maazel heard earlier this summer at the Castleton Festival. Singers, both soloists and chorus, veered off regularly in their own directions, and the orchestra that had sounded so confident the night before, under Frédéric Chaslin, seemed tentative and a bit off-kilter. Without some incisive ideas from the podium about the score, singers made many of the decisions, making the end of the Act III duet, for example, drag out to an exasperating degree. La Tautou to Call It Quits?